Abbiamo fatto un tentativo di riprodurre degli oggetti della mostra “IMAGINARY Open Mathematics Exhibition” (www.imaginary.org), utilizzando delle stampanti 3D desktop a basso costo. Il progetto internazionale “IMAGINARY Open Mathematics Exhibition” dell”Istituto tedesco “Mathematisches Forschungsinstitut Oberwolfach” comprende gallerie di oggetti tridimensionali che sono unici, attraenti esteticamente ed hanno un significato matematico. 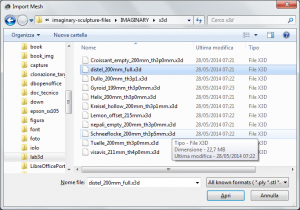 Qui si illustra la realizzazione di vari oggetti didattici, utilizzando la nuova tecnologia di stampa 3D a basso costo, basata sulla tecnica di produzione additiva di tipo “Fused Deposition Modeling” (FDM) e l”uso di plastica biodegradabile online casino PLA. L”obiettivo finale e” quello di supportare i musei, le scuole e gli istituti di istruzione superiore nei paesi meno attrezzati di infrastrutture scientifiche. We have made an attempt to reproduce few objects of the IMAGINARY Open Mathematics Exhibition (www.imaginary.org) using low-cost, desktop 3D printers. The IMAGINARY open math is an international project by the Mathematisches Forschungsinstitut Oberwolfach in Germany and includes galleries of volumetric objects that are unique, have aesthetic appeal and mathematical meaning. We illustrate here the printing of these diverse learning materials using new 3D affordable printing technologies based on Fused Deposition Modelling (FDM) and the use of biodegradable plastic PLA. The final goal is to support museums, schools and higher education institutions in countries with limited scientific infrastructure. 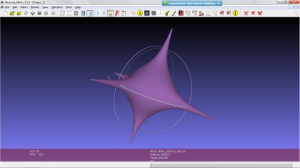 This entry was posted in ICTP SciFabLab, Math Exhibition using Low-cost 3D Printers on 2014/09/22 by Enrique Canessa. 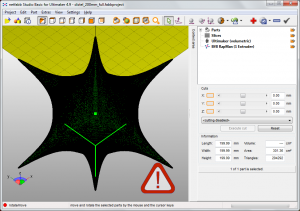 To print the mathematical shapes of the project “Math Exhibition”, I’ve selected the Ultimaker printers that are available, amongst others, in the SciFabLab. There are two of the “original” model, one with a dual extruder. After months of use, my overall assessment is positive: they are good machines, fast and accurate, despite some minor defect. For these printers I’ve used the Cura program to “compile” the 3D model and transform it into a set of G-code instructions to send to the printer. 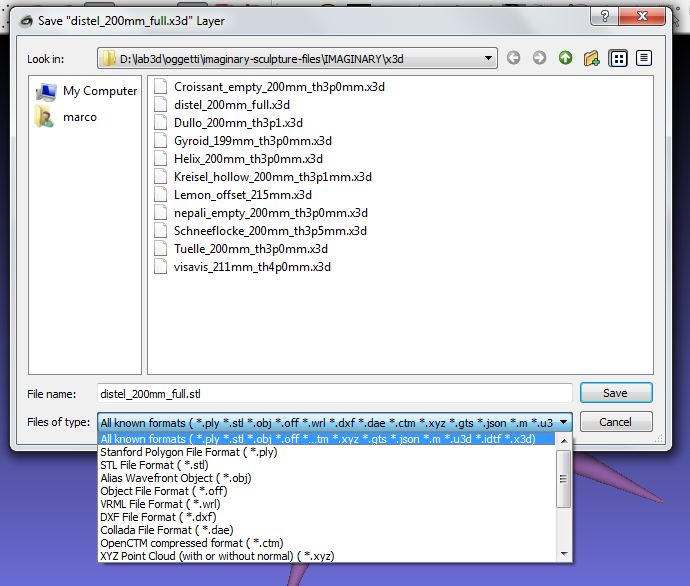 Actually, the Cura command “Load Model File” enables the loading of 3D models in these formats: STL, or OBJ, DAE, AMF, etc. 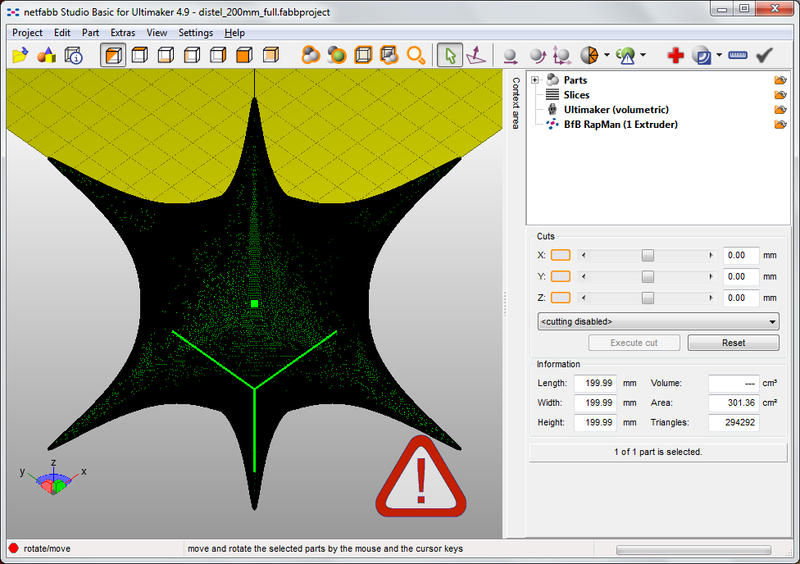 The first problem that has occurred in Project “Math Exhibition” was the fact that some of the 3D models were provided in X3D format, that “Cura” is not currently able to import. 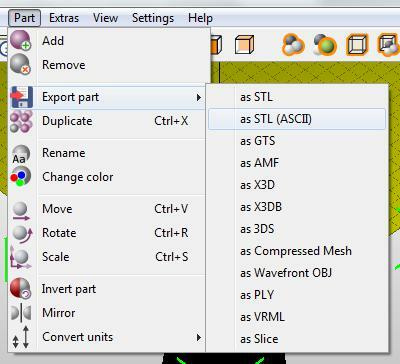 Before performing other steps, it was necessary to convert the X3D files in STL format. 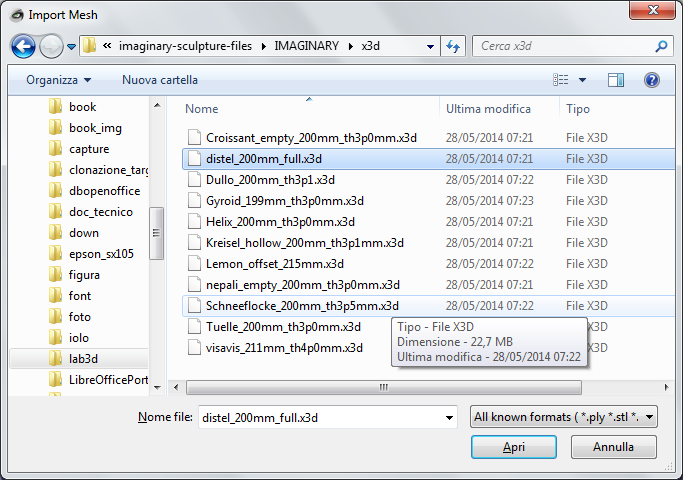 Select the x3d file. 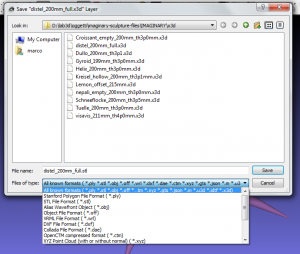 (for example: distel_200mm_full.x3d). 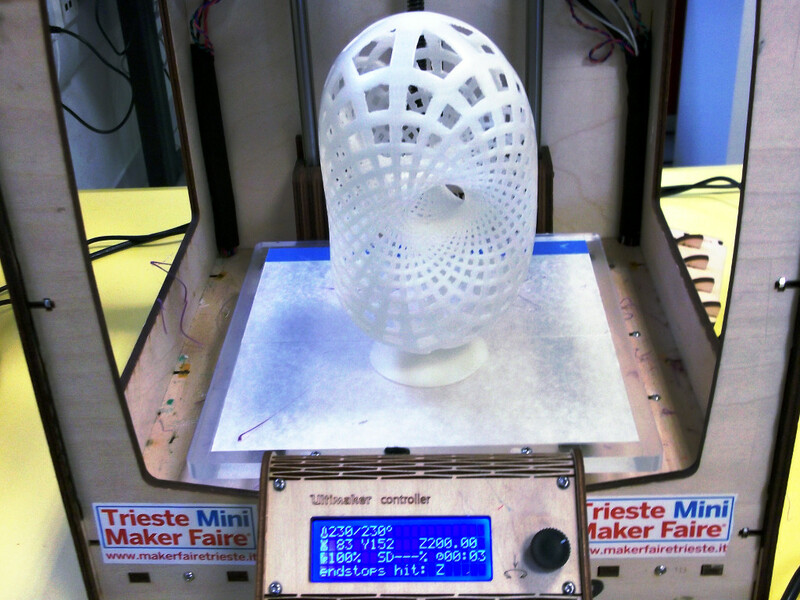 This entry was posted in ICTP SciFabLab, Math Exhibition using Low-cost 3D Printers on 2014/09/07 by Marco Rainone. where are displayed beautiful representations of curves or surfaces described by mathematical formulas, reproduced with kind of professional 3D printers. Naturally, professional printers have accuracy and print quality that absolutely can’t be compared with low cost 3D printers. We asked whether, applying various techniques and precautions, objects of a certain complexity that are normally made with professional printers, could be reproduced also with low-cost models and which was the quality that could be reached in prints. 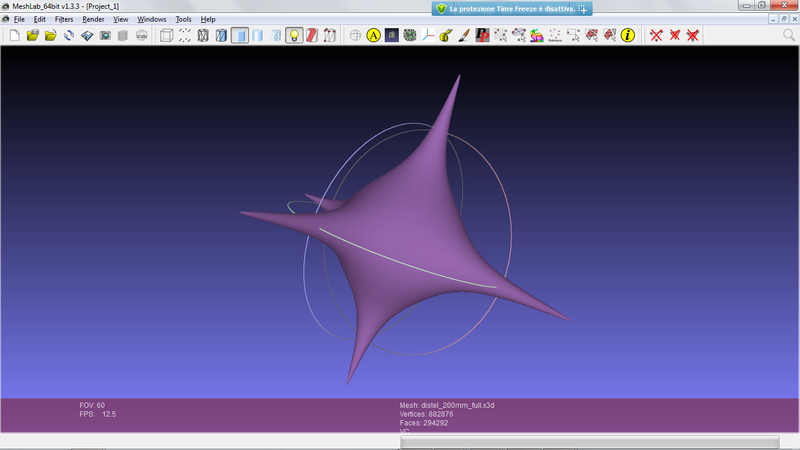 This entry was posted in Math Exhibition using Low-cost 3D Printers on 2014/08/31 by Marco Rainone.